Did you guys see Dancing With the Stars last night?? Yes, I know that has nothing to do with the card I'm sharing today - but really, did you?? Listen, I don't watch much tv outside of the Food Network, but DWTS is one show that we rarely miss around here. And this season has been by far the best. The finale last night was amazing and honestly, I couldn't have chosen a winner out of the three remaining. I would have been happy for any of them, they were all that good and were all, by appearances, wonderful people too. I'm not gonna give it away in case you haven't seen it, but if you DVR'd it you HAVE to watch it! Just Wow, end of subject. So, my card today may not be a just Wow!, but sometimes less is more and wins the day, know what I mean? I designed this card in early April for a special Evening of Stamping for a group of my achieving downline team. They got to come to the studio and make several projects using upcoming products from the NEW Catalog and enjoyed a special dinner with treats as well. It was a really fun event and I plan to repeat it - are you reading this team?? Get ready! 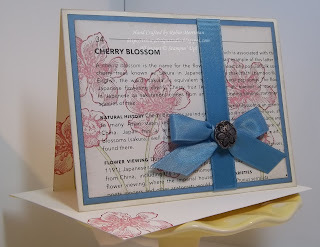 Little did I know that the Marina Mist Satin Ribbon that we used on this card was retiring at the end of May, but, it's a small detail that can be substituted, right? We used the Everything Eleanor Stamp Set and colored the flowers with Real Red and Old Olive. Combined with the Marina Mist, it was a color combo straight out of the Color Coach. A little sponging around the cardstock and First Edition Designer Series Paper in Crumb Cake gave it an antiqued feel, so the Antique Brad added to the ribbon bow was a great final touch. Does this qualify as Clean and Simple? I think so, plus it's pretty flat and could be easily mailed - a bonus! Have a great day stampers! I'm off to my Weight Watchers Weigh in and crossing my fingers that I've reached the 15 pound loss mark. That would be a great birthday present, right? Speaking of, My Online Birthday Bash begins at Midnight EST on Friday, May 25th and ends at 11:59 pm EST. Be watching for details here on the ol' blog tomorrow, or if you are on my mailing list, look for a special message in your inboxes tomorrow! very gorgeous card; WOW & WOW to DWTS!!!! I totally agree w/you about the winners! 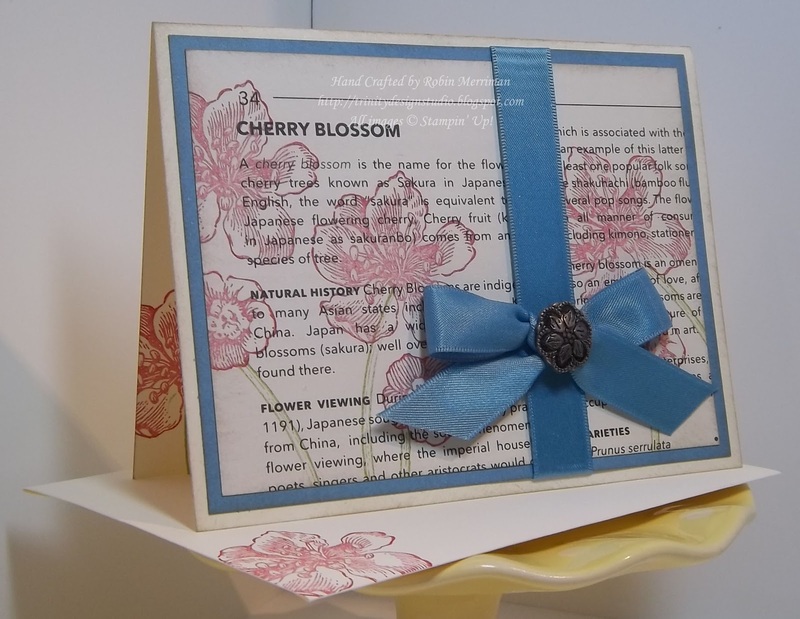 Your card is so clean, simple & lucious, a great addition to summer cards! !